Hello again! 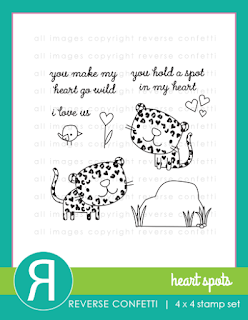 It's day 2 of the Countdown to Confetti January release and today we are featuring Heart Spots and coordinating Confetti Cuts. *Please note that new product links will not be active until release day/time. 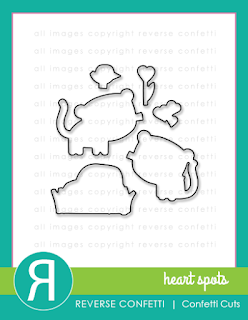 My projects include a fun window card and a treat bag filled with a package of animal crackers. I stenciled Iced Aqua ink over Iced Aqua cardstock using the Hearts stencil for the background. A banner of paper from RC's Every Little Bit 6x6 paper pad was used in addition to Class Act and Hello and Thanks Label Confetti Cuts. The images were colored with Copics. I love how you can build the new products with the old for so many options in design! My 3 year old granddaughter is going to share a treat bag with each of her day care classmates! Easy peasy to add a sweet Square Tag to a small kraft paper bag! PRIZES!!! We will be giving away a $15 gift certificate to one blog commenter and also to one Facebook commenter, so be sure to leave a comment on each sneak peek post for each designer. Comments will close at noon CST on JAN 7th and the winner will be announced at 5pm on JAN 7th on the RC blog and FB page. Make sure you head on over to the Reverse Confetti Blog for all the details! Love your card and your treat packaging! 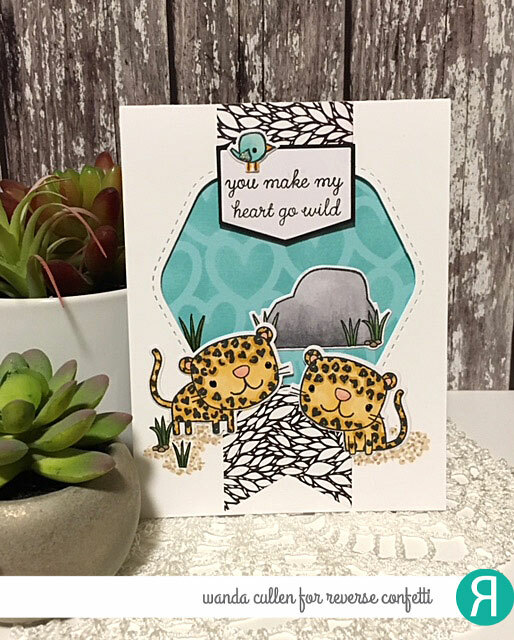 Fantastic card - love the color combination you used and the patterns you added. The treat bag is super cute, your granddaughter's classmates will love it! Such a fun layout on that first card! And the treat bag couldn't be any more perfect for Valentine's Day! All three are sweet creations, colorful and nice designs for the cards. The little treat bags are totally wonderful for your granddaughter and her friends. Love the coordinating image and treats! Wonderful inspiration! Adorable projects! This release is so fantastic! Beautiful card and I love how the square tag looks against the kraft bag! Really pretty!!! I really love the color palette in your card! The yellows of the leopards and the blue river look great together! Beautiful work! Your treat bag is going to be a big hit for sure! Love your beautiful card's fabulous design. Adorable! Love your fun and fabulous card & tag and this new release. Love both projects, particularly the cute little tag on the animal cracker packaging! What's not to love? These are adorable. Gorgeous and beautiful all in one! Adorable projects! 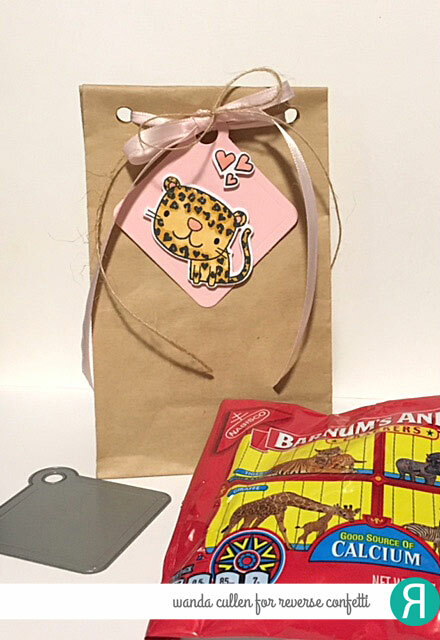 The tag is perfect for an animal cracker treat! So cute!!! Love your design, colors, patterns, and characters. And love the tag ideas. 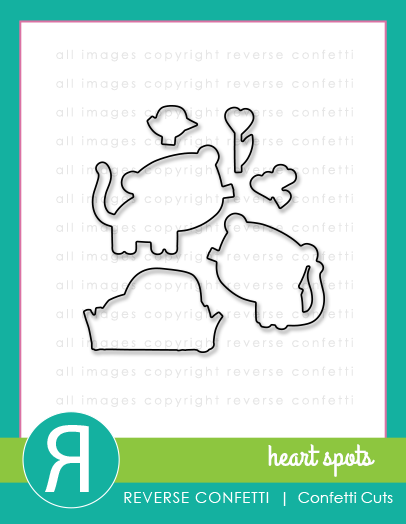 So darling with animal cracker/cookies is so cute too. Just lovely. Happy New Year! Clever card design and I like the cute treat tag. Cute tag and love the card with the very cool design. Just love the scene with the "rock" cut out. Cute projects! The blue/brown color combo is a great idea for the leopards. Your creations are so lovely ! 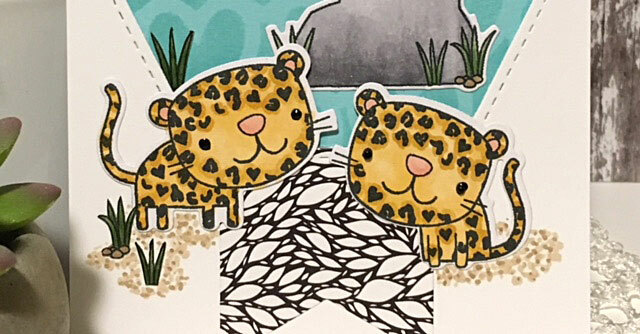 Adorable card, nicely colored leopards.